Exceptional Tilt remix of the Robert miles classic. Has all the hallmarks of Tilt productions from the time - deep intelligent emotive trance. The Breeder mix is much more stripped back with only sparse use of the classic piano build up/ breakdown. The production is tight as with all Breeder releaess and the end result is a hypnotic progressive driving mix. Robert Miles' "Children" was a trance anthem built on a simple piano melody, and simple trance beats. The result was surprisingly catchy, but it's certainly a track of it's time sounding extremely dated and trite only several years after it's original release. 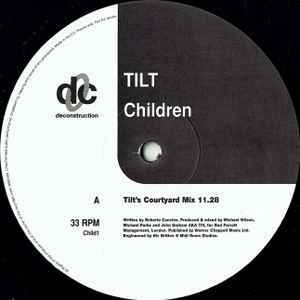 In 1999, Tilt came along and completely remade the track giving the song a much more progressive edge with a stronger beat and crescendos of swirling synths. The result was fabulous and gave the track a much more timeless quality sounding excellent even by today's anti-trance standards. Also included was an excellent remix by progressive trance beasts Breeder. The dark, minimal remix sounds nothing like the original, but is definitely of Breeder quality (which fans of this style of music should know all about). how good is this record hey :) great use of the sample from Robert Miles' classic Children. The Breeder remix is an awesome deeper track great sound, similar style to that of Breeder's remix of Grace - Not Over. This is a must addition to a Trance dj's box! I've got this release as a white label, and this is as close as I get to owning a Robert Miles track. Breeder's dub mix is a great deep number, where Tilt's Courtyard Mix hits that huge trance feel hard and on target. The breeder dub has potential to be a timeless cut.